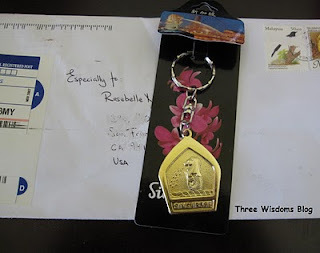 A fellow blogger from Malaysia sent me this lovely keychain as a token of appreciation to drop by her blog, In My World, during her hiatus from blogging a few months ago. I'm very appreciative of her thoughtfulness. I hung the keychain on my jewelry box and my ever so curious 8-year old daughter, who always seems to know every new thing in my bedroom, asked where did I get the keychain. I told her a friend gave it to me. She exclaimed, "You have a friend?!" Gosh, she sure made me feel like a loner for a second there. I'd be lucky to get 5 hours of sleep on a weekday let alone going out with friends. See, being a mom to three kids is a fulltime and overtime job 365 days. Thank you, Ladyviral, for 1) showing to my daughter that her mom has friends, and 2) taking the time out from your busy transition schedule to buy and mail this gift to me. Oh..keychain all the way from Malaysia..That's the wonderful thing about blogging. You get to know wonderful people around the world..
Hahaha! I like the part you mentioned that "showing my daughter I have friends"
I hope you like it :). Thank you for featuring it too ^_^. You have friends, we are your blogging friends. Isn't it wonderful that we not only share our experiences, but also our culture? She sure is very thoughtful! That is so very sweet. What a thoughtful gesture. Your daughter is so adorable! That was a very nice gesture. Really surprising. The symbol on the keychain is very unique--I wonder what it represents? Oh what a lovely gift to receive in the mail! A nice friend indeed. I had to chuckle over what your daughter said...as the saying goes "out of the mouths of babes". Isn't the blogging world a wonderful place to make new friends and get to know other people's thoughts around the world. It's amazing that you can be friends from so far away. I, too, feel like I've made friends with fellow bloggers! Thanks everyone for your kind words. The one thing I enjoy most about blogging is getting to know and meet new people from different countries. Ebie, I agree, the beauty of blogging is learning about different cultures. I have learned so much about politics and happenings in other parts of the world. Anthony, the animal on the keychain looks to be a seahorse with a lion head spitting out water. I have no idea what it represents. Now you got me curious, I would have to google it later. Thanks everyone again for your comments! By the way, thanks for leaving me a message in my blog that brings me here! Enjoy reading your blog! @AP - Thanks for explaining to us what the symbol on the keychain stands for!